In February of 2011, a group of Libyan women, inspired by the wave of peaceful uprisings across Egypt and Tunisia, protested the arrests of their male relatives outside a prison in Benghazi. Their actions inspired a swathe of Libyan society – particularly the young – to spill out into the streets and demand an end to dictatorship. 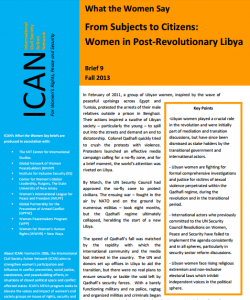 This brief draws particular attention to women’s experiences in Libya in the context of political and security developments in the past two years. It also highlights opportunities that the international community lost for sustaining and implementing the UN Security Council Resolution 1325 (2000) agenda on Women, Peace and Security.